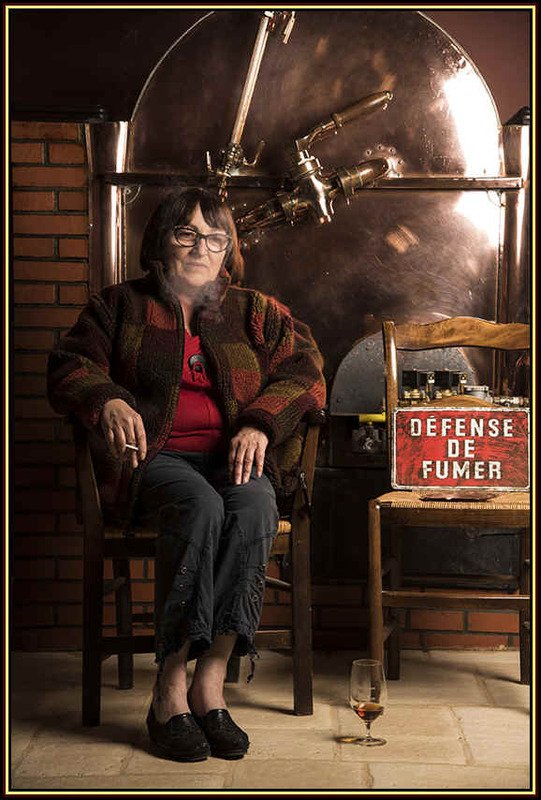 Ask Armagnac aficionados to name the top producers in the region and you'll hear the name Martine Lafitte of Domaine Boingn�res, Ravignan and probably Laberdolive. Darroze is a famous name, though it's a negociant firm, bottling single producer and often single vintage bottlings. Martine Lafitte and her late Mom Marguerite (a photo from a visit in 2003). This property cultivates its own vineyards and has about 22 hectares split amongst Folle Blanche (half), Ugni Blanc and Colombard. Martine's father Leon didn't think much of the Bacco grape which was often found in the Armagnac region and he was more interesting in cultivating more "noble" varieties. As you can see, they have a very modern and complex bottling line. Lafitte built a new cellar in the mid-1970s and a new winery, too. This allowed him to make the wine the way he wanted and he would not have to rely on someone with a mobile still to turn that wine into brandy. 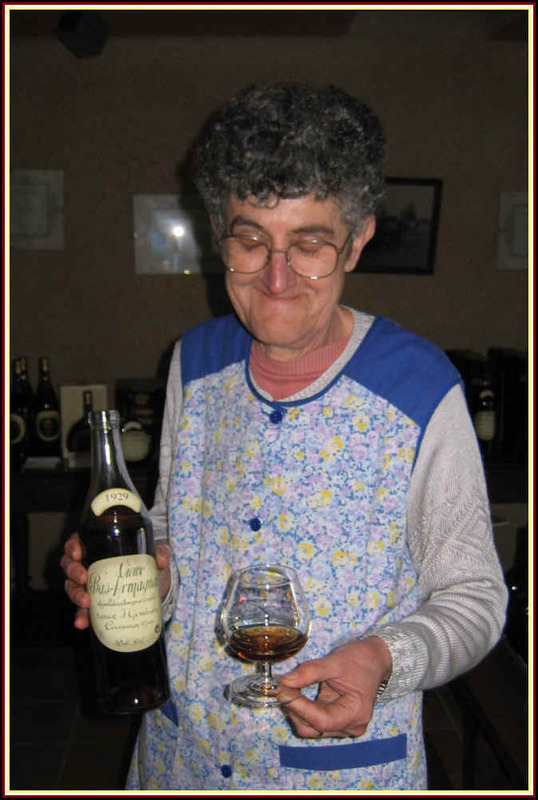 The old boy passed away in 1994 and his wife and daughter took on the job of making Armagnac with the same precision and attention to detail as Lafitte had. Marguerite died in 2004 and Martine runs the place on her own these days. 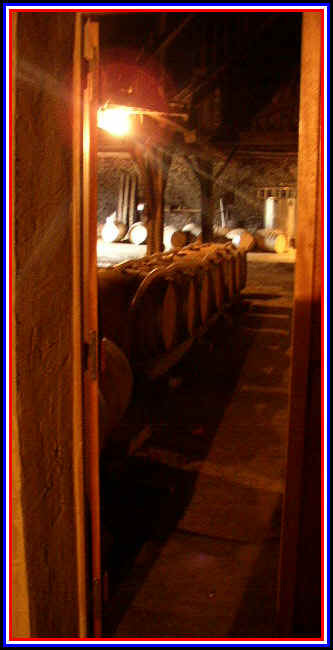 The oak cooperage in which she matures her Armagnac actually comes from forests in Gascony and she buys the wood and takes care of "curing" it herself so it is suitable for aging the brandy in proper fashion. 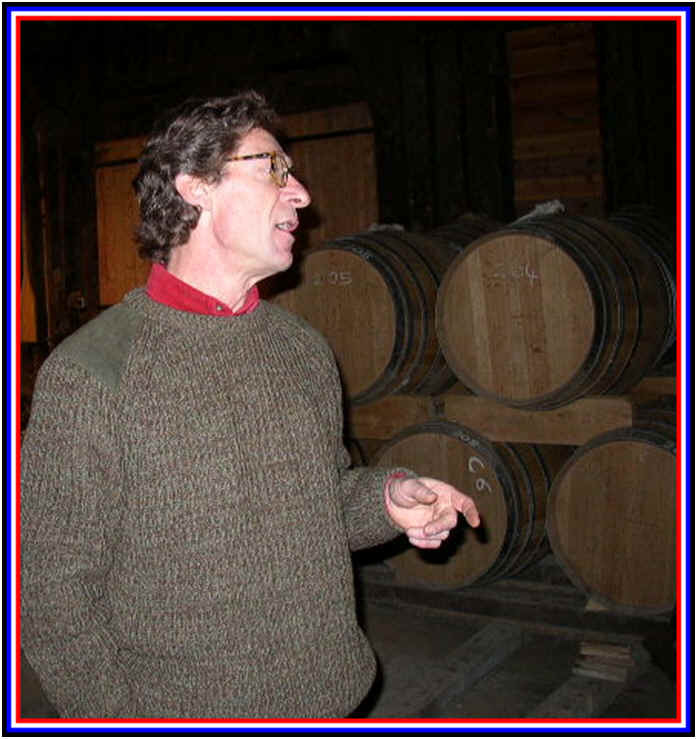 The fellow who coopers the wood is the grandson of a man who coopered barrels for Monsieur Lafitte two generations earlier! 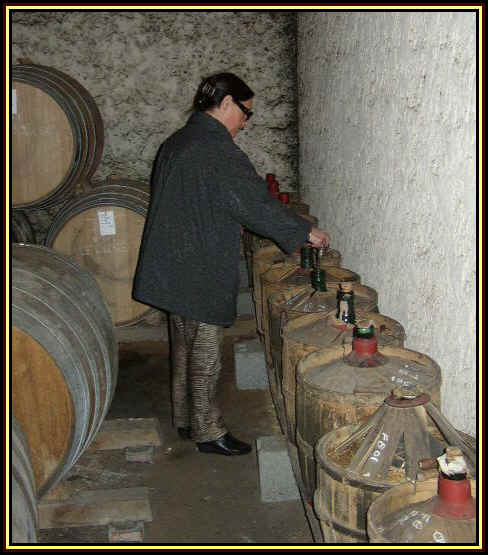 The grapes are picked with relatively high levels of acidity and to a low degree of alcohol which Martine credits for making the best quality brandy. 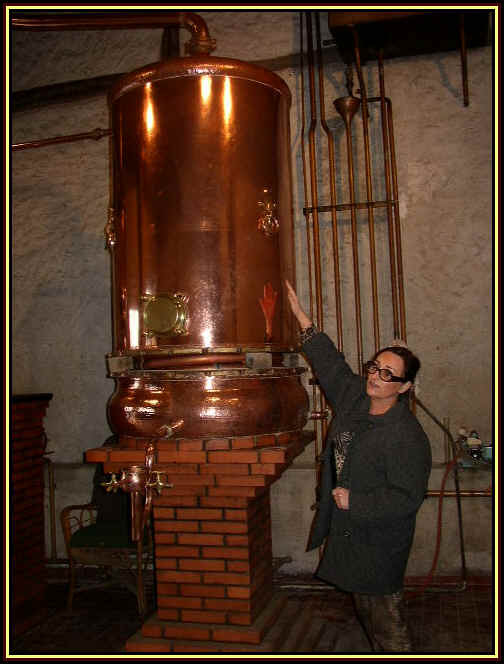 She tells us she likes to distill immediately after the fermentation so as to have good, fresh wine which has not been sulfured. The stills seen in the photos above produce a spirit of slightly more than 100-proof. Martine bottles her Armagnac at cask strength, by the way. 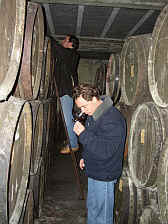 The cellars tend to be rather low humidity and with evaporation, the alcohol levels don't drop significantly. She won't add water to bring down the alcohol to 80-proof. 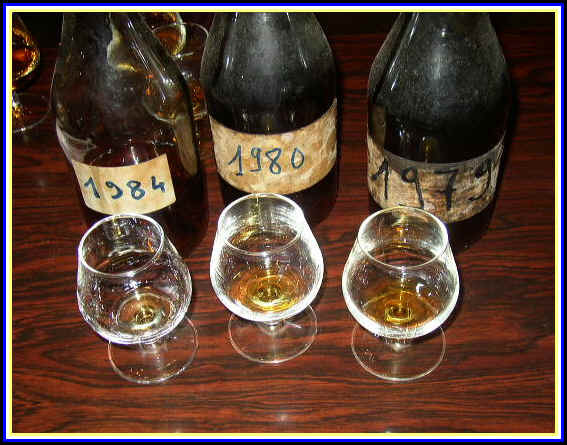 A Boingn�res Armagnac, then, may "put hair on your chest" and these are wonderfully complex. The basic "Reserve" is comprised of spirits ranging in age between five and ten years. It's a marvelous brandy and a great introduction to Martine's artistry. We typically have some of her single vintage bottlings, too (usually with the grape variety noted on the label). Martine is a chip off the old block...U.S. importer Charles Neal sent us this snapshot from a recent visit. 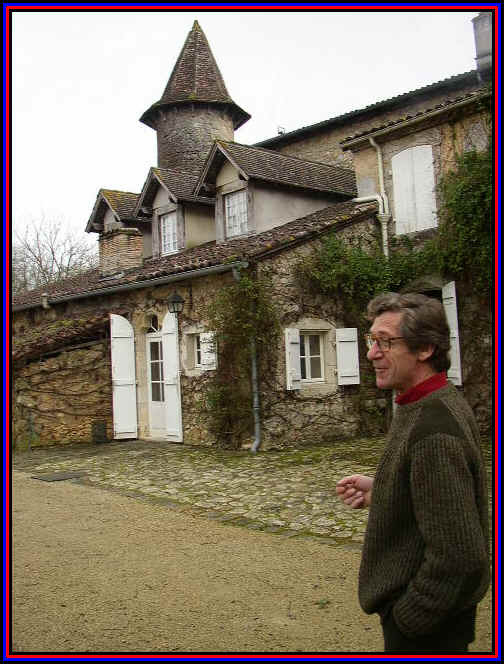 The owner of the famous Bordeaux wine estate Ch�teau Pichon Baron came into possession of a nice little "hunting lodge" and vacation place about 185 kilometers from Bordeaux's town of Pauillac. The place had been owned by Queen Jeanne d'Albret in the 1540s and, later, her son King Henri IV enjoyed the place. He gave the property to an army officer who'd saved his life. Back in the 1860s, this was probably a fairly arduous journey. Today you could drive from one place to the other in a bit more than two hours, depending upon the traffic. 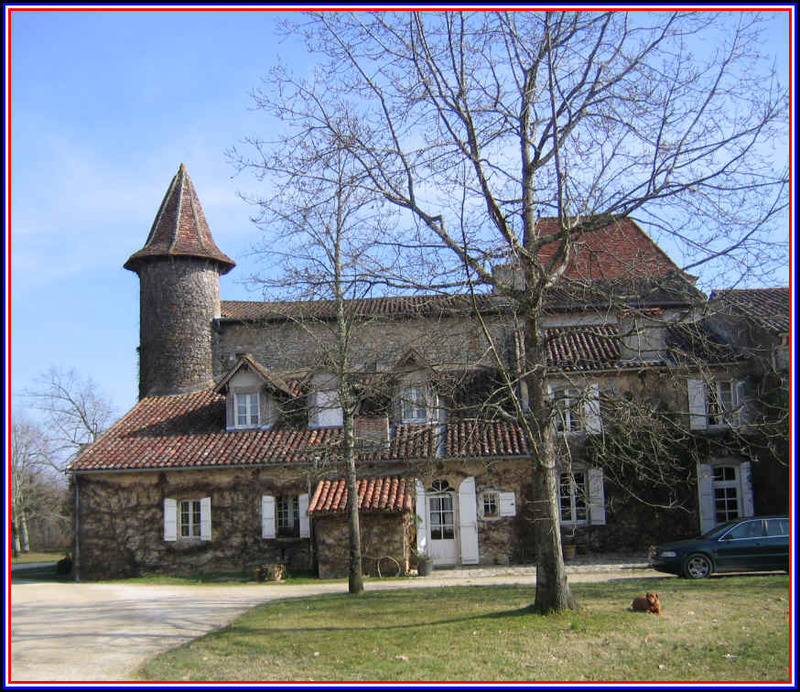 At some point the Baron sold his winemaking estate in the Medoc, one branch of the family retained the distilling property in Armagnac and this side of the family is named "de Luze." The place is still operated by the de Luze family. Gilles de Luze took over when his father retired. Gilles had been living and working in Paris for the Larousse publishing empire. 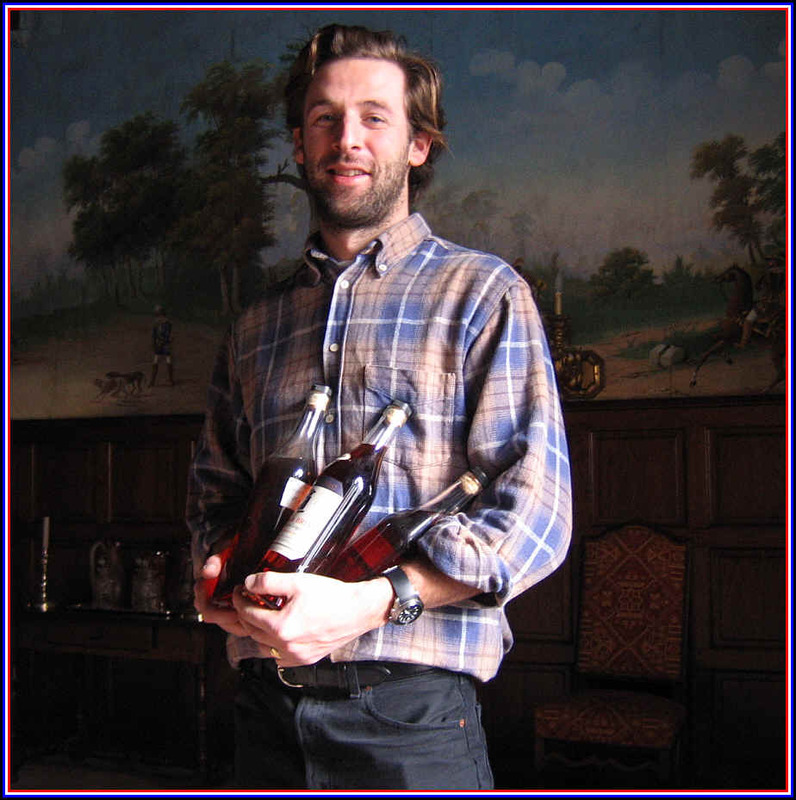 We met him in the early 2000's and he was justly proud of the terrific brandies made at Briat. He and his wife were tragically killed in an auto accident heading back to Paris from some sort of salon in Lyon and their son Stephane took the reins of the estate. He teamed up with his cousin Jean de Mareuil and they ran the place together until 2014...now Stephane supervises the entire operation. Production is small. 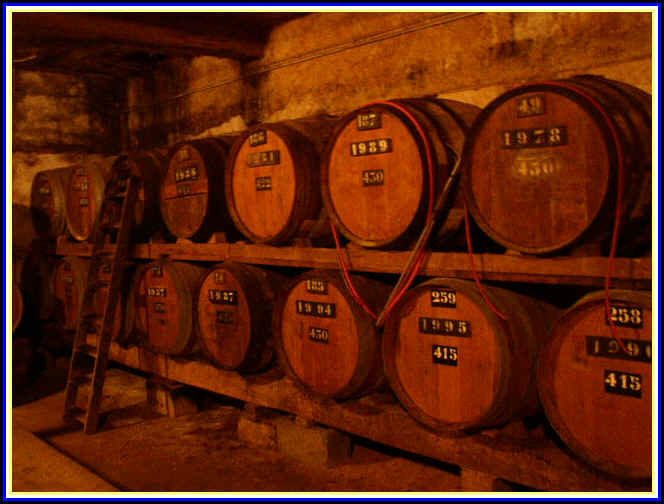 They make just 15 barrels of Armagnac annually. An artisan distiller with a mobile machine comes to distill their wine. 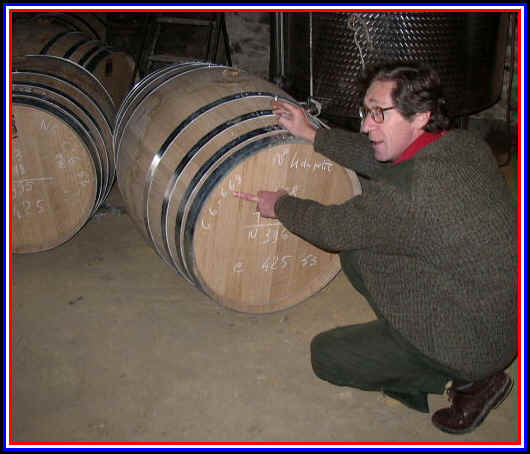 De Luze owns but a few hectares of vineyards and insists upon low yields in the vineyard to obtain a somewhat more intense product of which to turn into Armagnac. In fact, he replanted many of the vineyards and today they have a mere 8 hectares producing. Folle Blanche, Baco and Colombard are planted in their vineyards. Stephane points out they make perhaps 8,000 bottles a year and with lengthy aging and the resulting evaporation, they'll bottle approximately 6,700 bottles. Stephane is not interested in expanding vineyards and production. He prefers to focus on quality which he says "is our identity." De Luze points to this as the reason for the success of the enterprise. 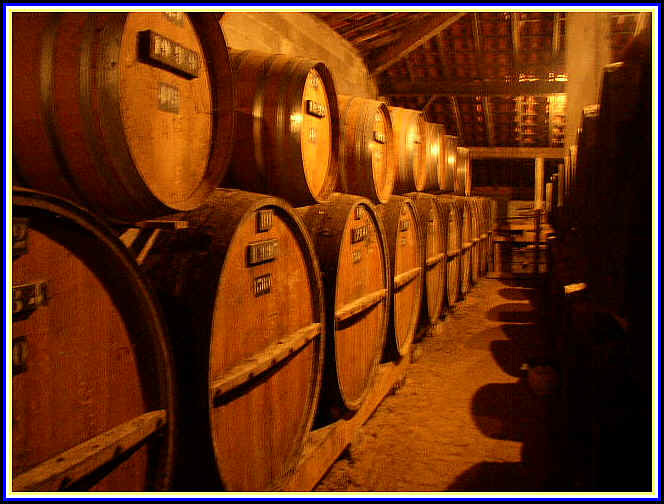 The brandy goes into new oak barrels made of wood from local forests in Gascony. It stays there for 3 to 5 years and then it's racked into old, season (and neutral) cooperage until it's ready for blending and bottling. Some batches don't get blended until they're ten years of age. 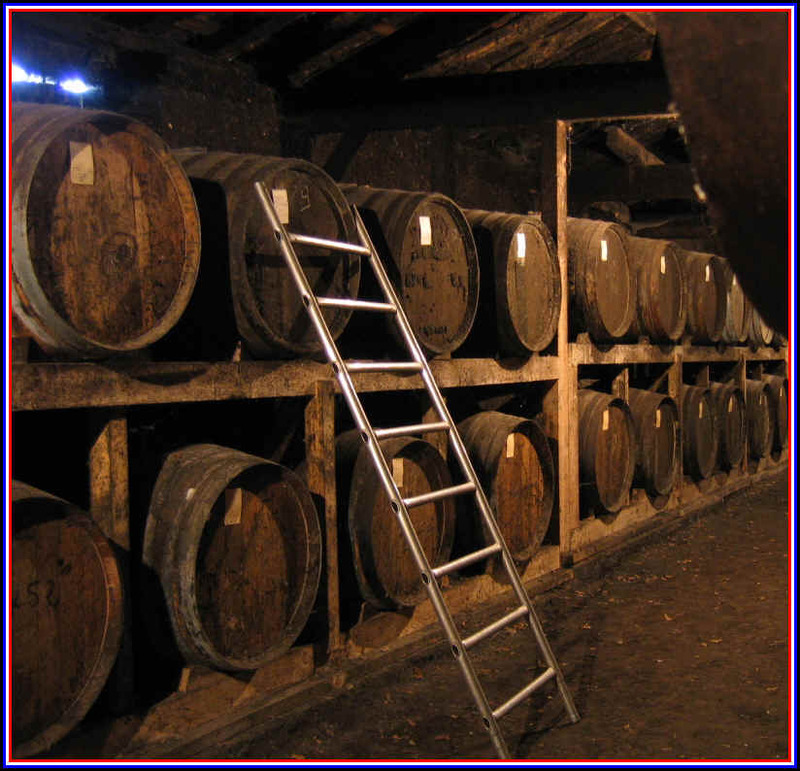 They don't top up the barrels, nor do they add water to knock them down to 80-proof. 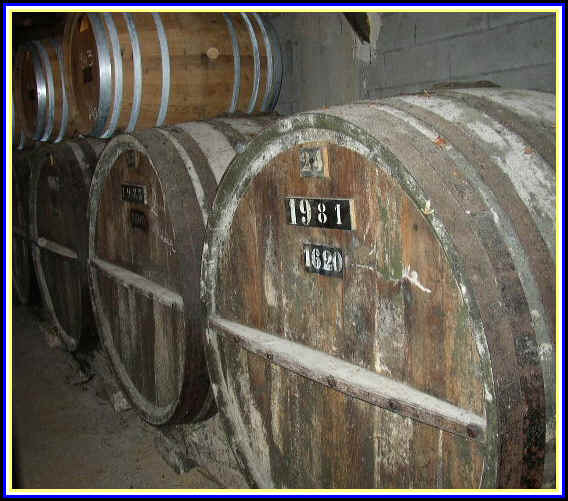 De Luze makes a blend of different barrels for the Hors d'Age Armagnac, while some barrels are bottled without being blended and these you will find bearing vintage dates. The current Hors d'Age bottling features spirits of ten+ years of age. Very good aromas and this is subtle on the palate until the finish which blossoms handsomely and gives a fullish quality to the spirit. There's a 1995 vintage bottling which is made solely of the Baco grape. Twenty-one years in wood before bottling creates a fabulously aromatic spirit with notes of orange peels and brown spices. It's dry and full on the palate...very elegant and this makes for a wonderful post-prandial potation. As noted above...it's a small production product. 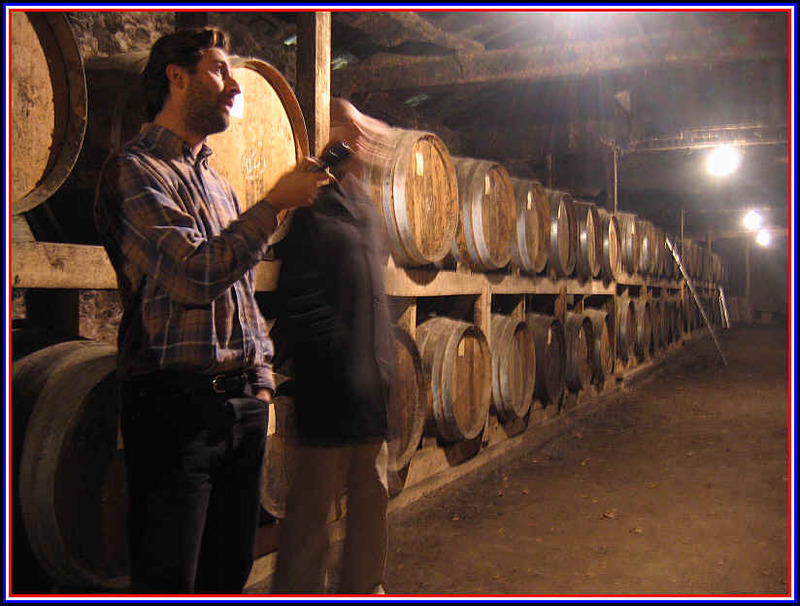 Importer Charles Neal tasting Armagnac at Ch�teau de Briat. This is quite an historic property and it's been held by the same family since 1732. Building began in 1663 continued into the 19th Century. Some things take time. 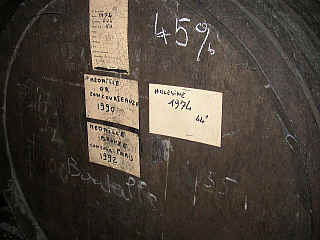 Same with maturing Armagnac. It takes patience. 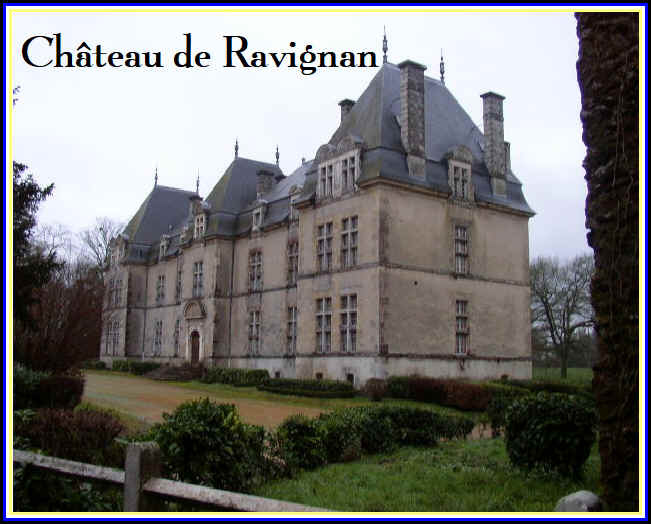 The property was acquired by Jean Le Croix in the 1700s and today the family goes by the name "de Ravignan." The name of the place comes from a couple of ravines on the property. 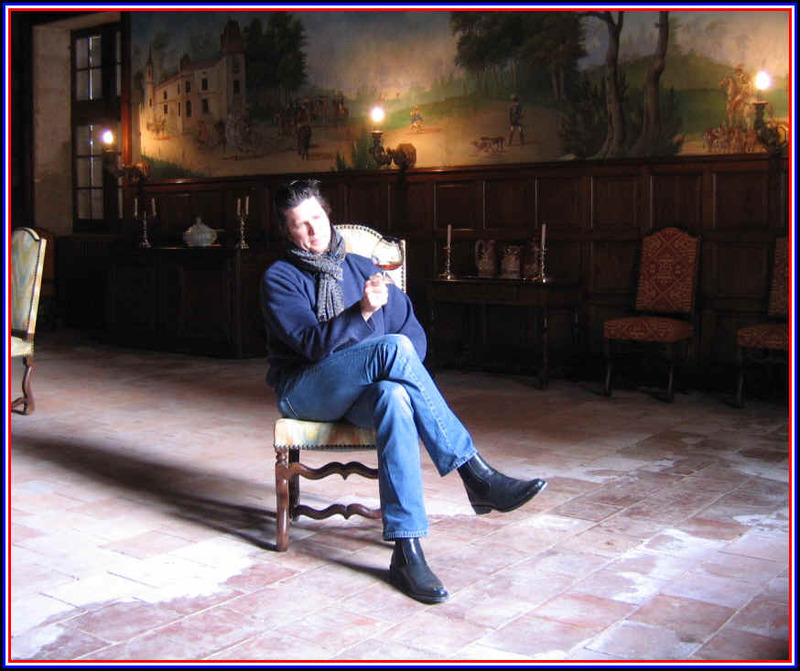 A tour of the chateau is remarkable as they have many old works of art from generations ago. Vineyards, comprising about 20 hectares, are devoted to Folle Blanche, Baco, Colombard and Ugni Blanc. 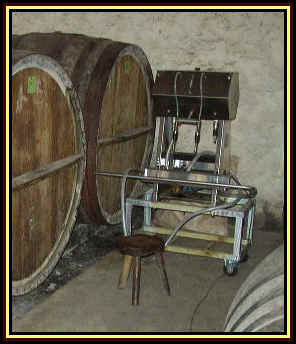 They use a "Continuous" Still and say it takes about seven liters of wine to create one liter of brandy. They don't believe in shortcuts, so the brandy is typically matured for ten to twelve years before bottling...but that's just the young Armagnac. We often have 25-30 year old bottlings in the shop and these come at a pretty good price, especially when you consider how much is lost as the brandy evaporates in barrel. Some years ago, driving around Italy with famed winemaker and distiller Mario Pojer, I was asked if I knew the products from Ravignan. "Oh yes," I replied. 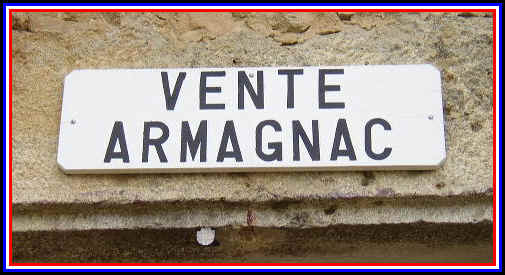 "We have several vintages of their Armagnac in the shop." "Damn," he said. "You folks know all the good stuff." Their brandy typically goes into new wood from Gascony and Limousin for a brief time before being racked into older, neutral wood barrels. They don't add water to reduce the alcohol level of the spirit, which usually comes out of the still around 52%. We currently have a 1981 Vintage in the shop, along with the 1985. Both are sublime. We find a hint of orange peel in these with a mildly resiny tone. They are dry, smooth and have a bit of a kick on the finish. Ravignan makes a good Floc de Gascogne, too. We have some bottles of this usually, too. You can see how the color changes as the spirit is matured in wood. It goes into barrels a clean and colorless and over time it acquired a brown tone. Some bottles for tasting during a visit in the early 2000s. This estate grows its own grapes, makes its own white wine and distills its own Armagnac. We have their V.S.O.P. 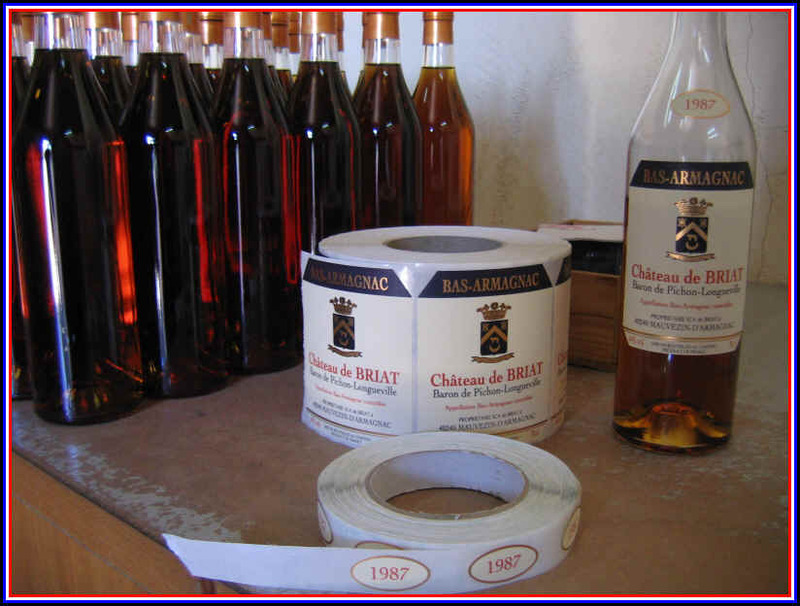 in stock and it's been our best-selling Armagnac for several years due to its good quality and modest pricing. The brandy is 60% Ugni Blanc and 40% Baco. It's aged about 7 or 8 years in wood. Owned by the Beraut family, we've had their outstanding table wine in the shop for a few years. Now they're sending us some bottles of Armagnac, one of the top estates in the Tnarze region. One of the Beraut brothers worked for the Grassa family who own Tariquet (the estate listed above). He apparently studied well, because the brandy they've sent us is outstanding! It's designated merely as a "Reserve" bottling. It's quite old and the nose is fantastic. On the palate the spirit has a spice and vanilla character. Very fine! The current bottling is from a spirits distilled in the late 1980s. It's delicious and dry...very intense. A gold earned in 1990 and a Bronze in 1992. 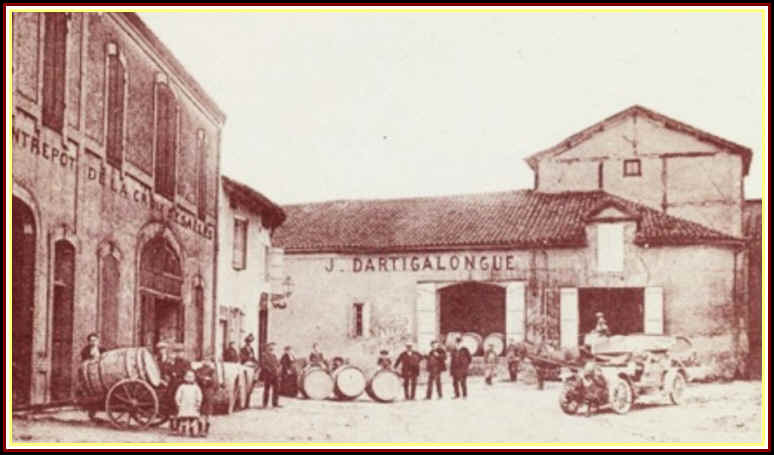 The history begins in the 1830s and Dartigalongue is the oldest Armagnac producer in the Bas Armagnac region. 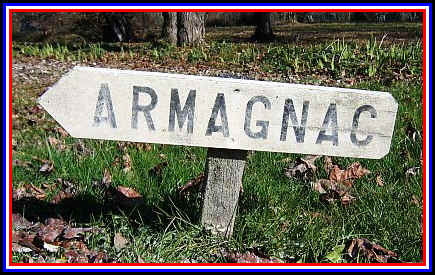 It's a diverse producer in that they not only offer interesting bottles of Armagnac, some of their own production and some purchased from tiny distillers in the region, but they also make alcohol to sell in bulk to various companies scattered around Europe. 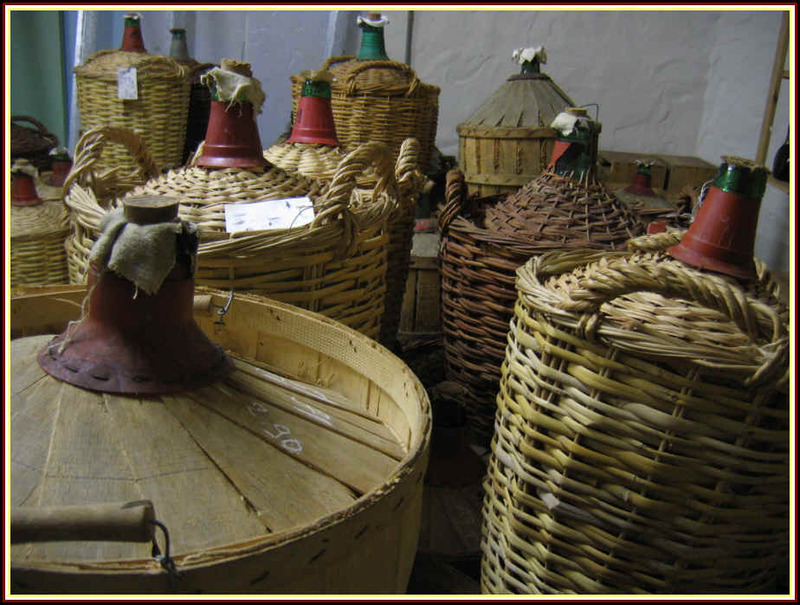 Dartigalongue matures its Armagnacs in locally-grown oak barrels and they have several cellars for aging the brandy. Young spirits are housed in the Chais des Moules. It's a building where the temperatures vary wildly over the course of a year and the family credits this with contributing a measure of character (and quality) to their brandy. 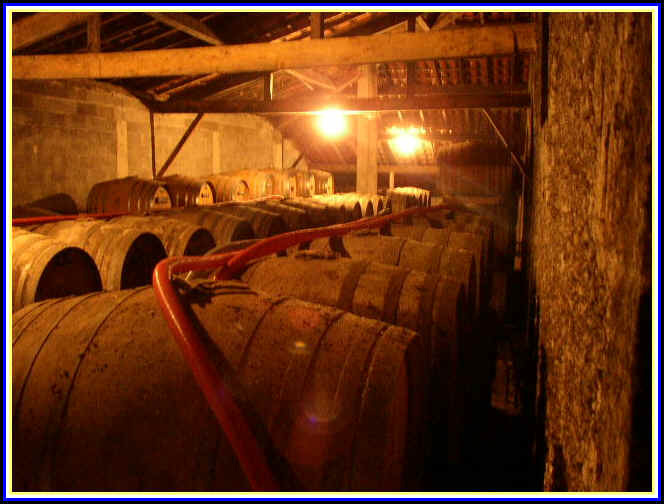 From there, the Armagnac is transferred to the Chais du Jardin, a more humid environment. Spirits given prolonged aging are matured in the Chai de Vieillissement. 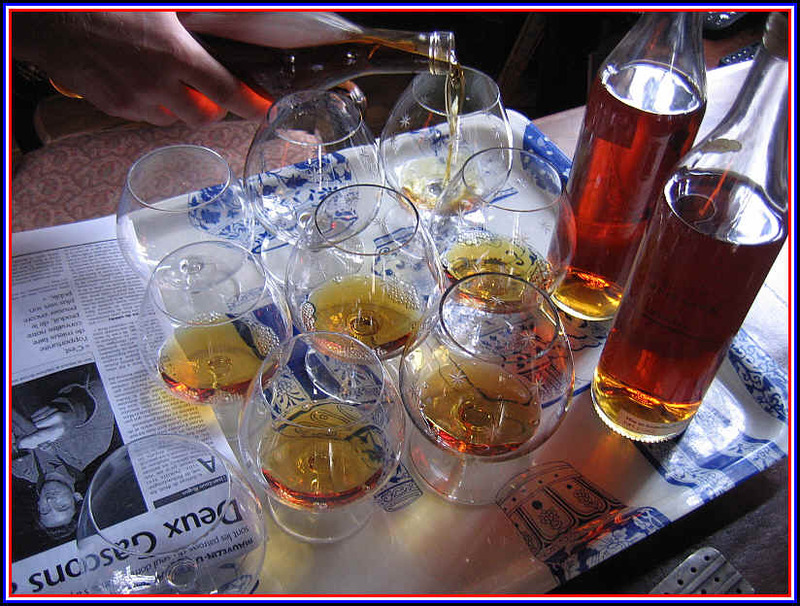 Eventually the brandy comes out of wood and into glass demijohns. They have quite an extensive collection of old spirits, too. 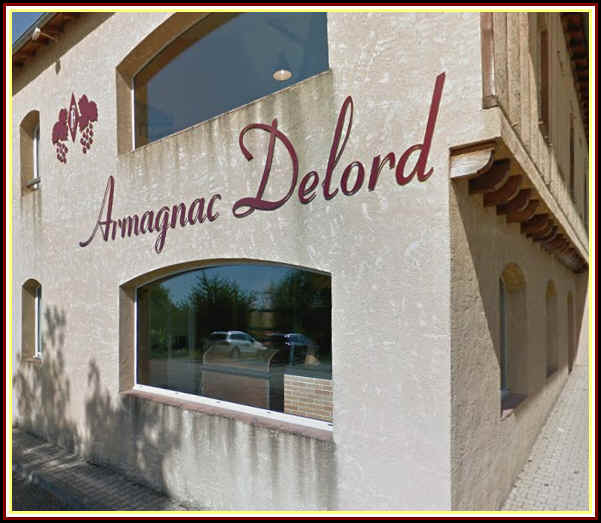 The Delord family traces its brandy-making history back to the late 1800s when Prosper Delord prospered by working with a mobile still and distilling for friends and neighbors in and around the Armagnac region. 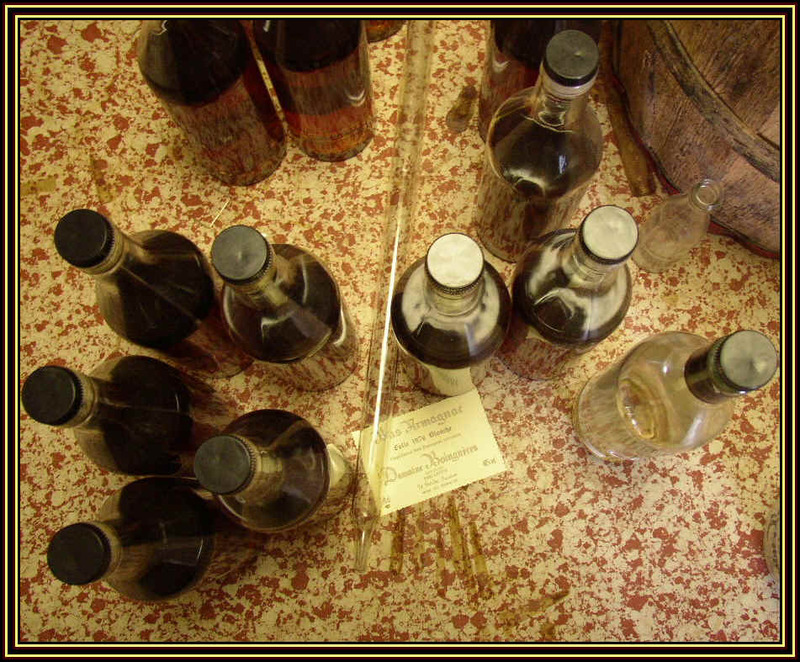 In the 1930s Prosper's sons started bottling and selling Armagnac and the place is still run by family members. They have more than 40 hectares of vineyards with Ugni Blanc and Colombard accounting for much of the production. There's a bit of Baco and a tiny amount of Folle Blanche. Sylvain Delord is the master distiller here and they use two types of stills to produce their brandy. 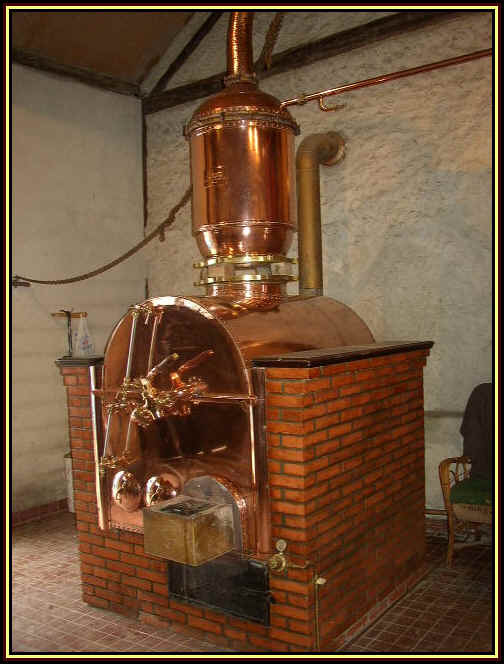 You'll find traditional Armagnac stills, but they also have Cognac-styled machinery, too. This is a bit unusual. They say the traditionally-distilled brandy displays more fruit, while the double-distilled spirit is a bit less expressive. Delord looks for softness in their brandies and you will find them to be exactly as intended. Perhaps these are not the most complex expressions of Armagnac, but they are of good quality and we've noticed customers return for a second (or third+) bottle after buying their first. 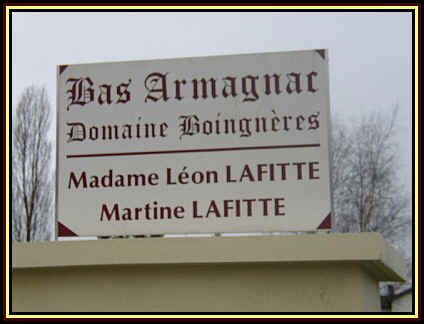 We have had some nice Armagnac of the Marie Duffau label. It's from the Delord company, as Marie Duffau was married to Prosper Delord back in the early 1900s. The Marie Duffau label is sold here in the US as well as a few places in Europe. The 1979 vintage was bottled in 2009...good value for a 30 year old Armagnac. 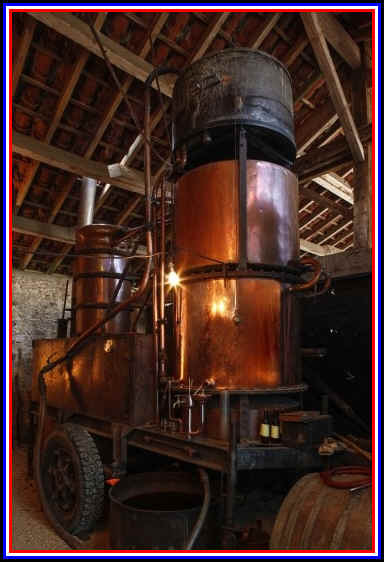 The Goudoulin family was distilling brandy around the turn of the 20th Century but selling Armagnac was not part of the protocol until 1935 when Joseph Goudoulin's widow started the commercial part of the enterprise. He passed away in 1925 from injuries suffered in World War I and they had a cellar full of aged and aging brandy. She ran the business for years and her grandson, Christian Faure, took over in the 1960s. 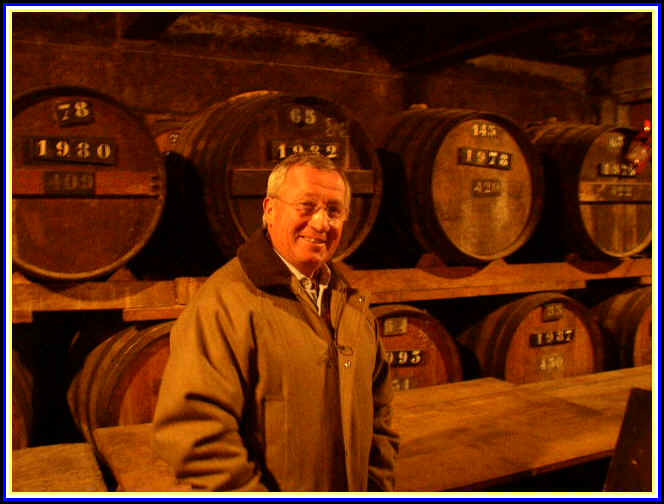 He retired in 2009 and sold the place to Michel Miclo, a distiller of note from the Alsace region. 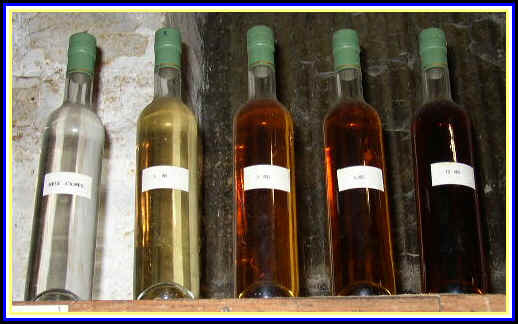 Miclo continues to make some lovely brandies and sell old vintages that remain in their cellar. We typically order bottles of old vintages annually and have a nice selection of diverse years which make a great gift for birthdays and anniversaries. These are bottled, one at a time, by hand from these old glass demijohns. We were asked if we'd like a taste as we poked around the cellar. You won't hear a "no" out of me! This was remarkably serendipitous...a taste of Armagnac from our late Mom's birth year! 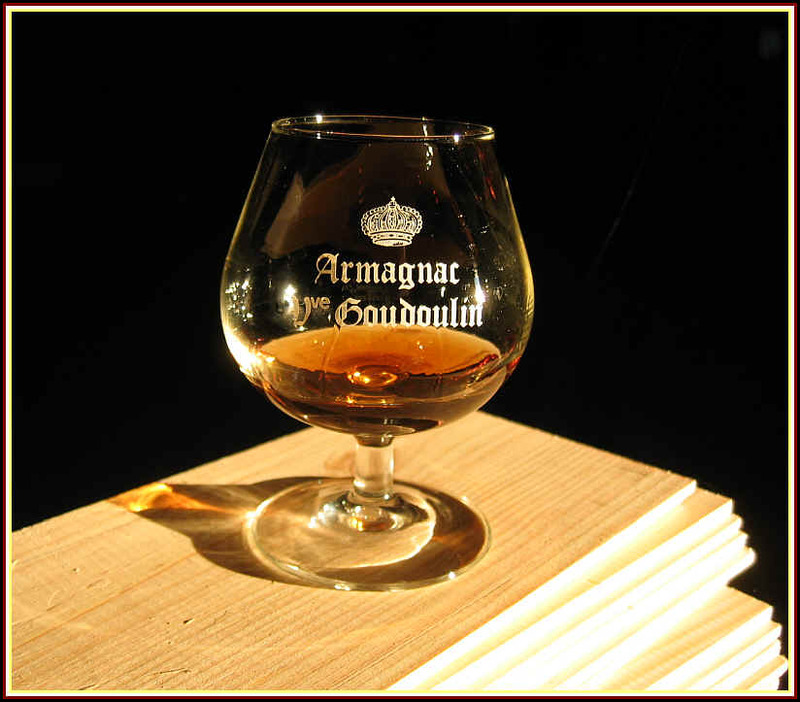 We have a good selection of Goudoulin Armagnacs. Stop by and have a look! Sold by the famous Burgundian liqueur producer, Vedrenne. It's a brandy made along the lines of Grappa, but from Grand Cru press cakes of grapes going into Grand Cru wines from the Hospice de Beaune. It's matured in wood and this helps tame this mildly fiery spirit. You can offer this in place of a good Cognac or Armagnac. Other Armagnacs. Presently in the Shop: Sempe, Loubre, Samalens, Janneau and some various Darroze bottlings. A fortuitous meeting, according to the legend of this artisan brandy producer, as Monsieur Hubert Germain-Robin was picked up hitch-hiking by Ansley Coale. This turned into quite a partnership, as Germain-Robin's family had sold its holdings off to the humungous Martell Cognac firm. Germain-Robin didn't like the idea of working for a "big business" establishment in France, since the corporate bean counters usually have more influence than the people at the production end of the scale. Visiting the United States, Germain-Robin was looking for a place to set up a distillery to produce Cognac-styled brandies. 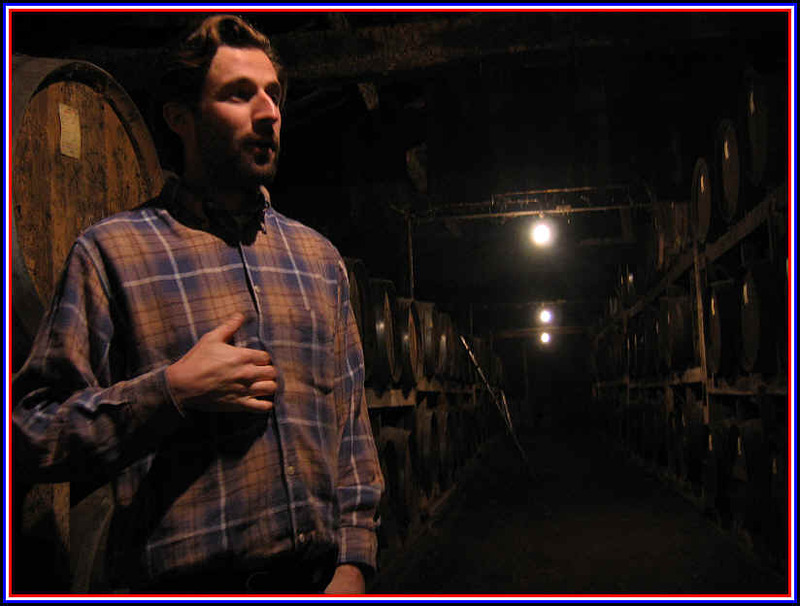 He started producing brandy in Mendocino County, a couple of hours' drive north of San Francisco. They are making some extraordinary brandies, easily on par with good Cognac and Armagnac. As most Cognac stems from rather flavorless fruit, Germain-Robin's brandies have, perhaps, a more flavorful starting point. 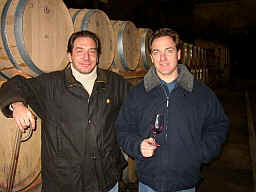 They've made brandies from Gamay and Pinot Noir with outstanding results. They credit the flavorful, high-acid fruit with accounting for the elevated quality of their brandy. We were amused to read some "talking points" provided to sales reps for Germain Robin. It starts out saying some people prefer Germain-Robin to mass-produced, factory Cognac for the same reason some people buy artisan-roasted coffee instead of Folger's or Maxwell House. They further explain that "the basic reason" for someone to buy Germain Robin is "simple...it's real and it's a fabulous product." They advise their sales reps not to sell this to someone who won't taste it. They basically explain if the buyer does taste and doesn't see the difference in quality, "don't bother...move on." In the summer of 2017 Gallo purchased Germain Robin. Will the quality remain good? How will this affect the quality? The sales rep for the distributor which has offered Germain Robin products is seemingly unaware of the departure of those products from his portfolio. The sales rep who works for the Gallo distributor has not said a word about his company offering Germain Robin products, so it's not clear that he is aware of the addition of these items to his portfolio. We have long been allergic to Gallo products for a variety of reasons, so it's likely Germain Robin brandies will disappear from our shop as the inventory is depleted. 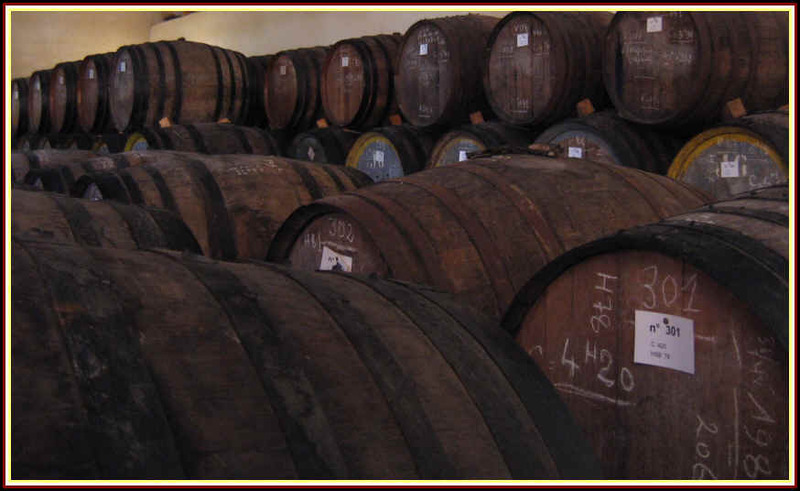 Most of it is produced in the south and are labeled as "Brandy de Jerez". The rest comes from Catalonia, south of Barcelona. 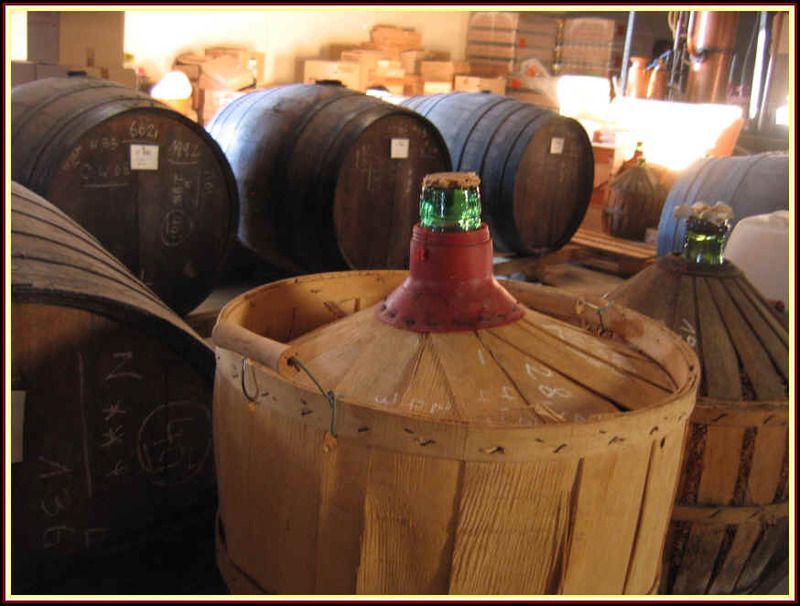 The Brandies produced in the sherry-making area of Jerez are typically continuous still distillations rather than pot-still products. They tend to be aged in old sherry casks, which greatly influences the aroma and flavor of the brandy, especially those in old Oloroso cooperage. Brandy de Jerez-Solera Gran Reserva 36 months minimum aging (though in practice, they usually spend 8-10 years in wood. The Sherry producer Romate makes this exceptional brandy in two formats. We stock their "normal" bottling of this, a deep, rich, fragrant, sensual brandy with so many flavors! Where to start? It's nutty, somewhat in the manner of a sherry. But there's an amazing spectrum of flavors: orange peel, dried fruits, cocoa, mocha, vanilla. And you'll find it's big and rich with an aftertaste which will probably go on longer into the evening than will you. Making Some fantabulous Sherry wines, Lustau's Spanish Brandies are not to be overlooked. They do not promote these very much and yet produce two magnificent brandies, a standard bottling which has a nice touch of wood to it and a deluxe bottling, a Reserva, which is obviously significantly older and more oaky, vanillin and rich. Now The property of the Williams & Humbert firm, makers of Dry Sack Sherry, this is a deliciously nutty old brandy with hints of molasses and vanilla cream. Very rich...great nose! Long finish. After a long absence, this exceptional Spanish brandy is back in stock! It is another Brandy de Jerez, that is, a brandy from the region where Sherry is produced. When matured in wood for about a dozen years, the spirit mellows quite handsomely. This one is particularly fine, having sweet notes on the nose and palate, but finishing dry. The "regular" bottling of Lepanto is $53.99 at the time of this posting.